Everyday in the US we use 500 MILLION plastic straws: it's enough to wrap around the Earth's circumference 2.5 TIMES A DAY!! At Fillgood we think this is ridiculous: it's an unnecessary object that massively pollutes our oceans. We can get rid of it, there are better options! The Last Plastic Straw is a movement to eliminate single use plastic at the source and a project of Plastic Pollution Coalition. They provide all the resources and tools necessary to help people and businesses who'd like to join the movement and stop using plastic straws! Why should we stop using plastic straws? Plastic straws are NOT RECYCLABLE: they are too small and therefore have no value on the recycling market. They end up in landfills or the oceans where they don't biodegrade. Instead, they slowly breakdown into micro-plastics and affect our health, our environment and our oceans. Stop using straws or switch to stainless steel, bamboo or glass. Stainless steel and glass can last forever, bamboo will last about a year and is fully compostable. And they can all be cleaned with a brush. It's so much better than plastic! Request "no straw please" when you order your drinks or bring your own, packed in a cute strawsleeve! Talk about it with your favorite bars and restaurants. Ask them to serve straws on request only or to switch to a compostable or reusable option. You can even leave them this card so they can learn more on the campaign's website. New Product, Zero Waste, Zero Plastic! We are very excited to announce our partnership with Tap Tap SF, a San Francisco based brand, strongly committed to provide plastic-free products! Their wonderful Head to Toe moisturizers, made with organic ingredients, have a unique smooth whipped buttery texture we fell in love with! 2 scents are available: lavender and unscented. We collect the glass jars when empty and they are refilled in San Francisco, in Tap Tap SF studio. Since both companies are in the Bay Area, on both sides of the Bay Bridge, the impact of shipping is very limited : short distance, no disposable packaging, pick-up and drop-off coordinated with our delivery route. Except for the tags, it's a waste free process we're very proud of! 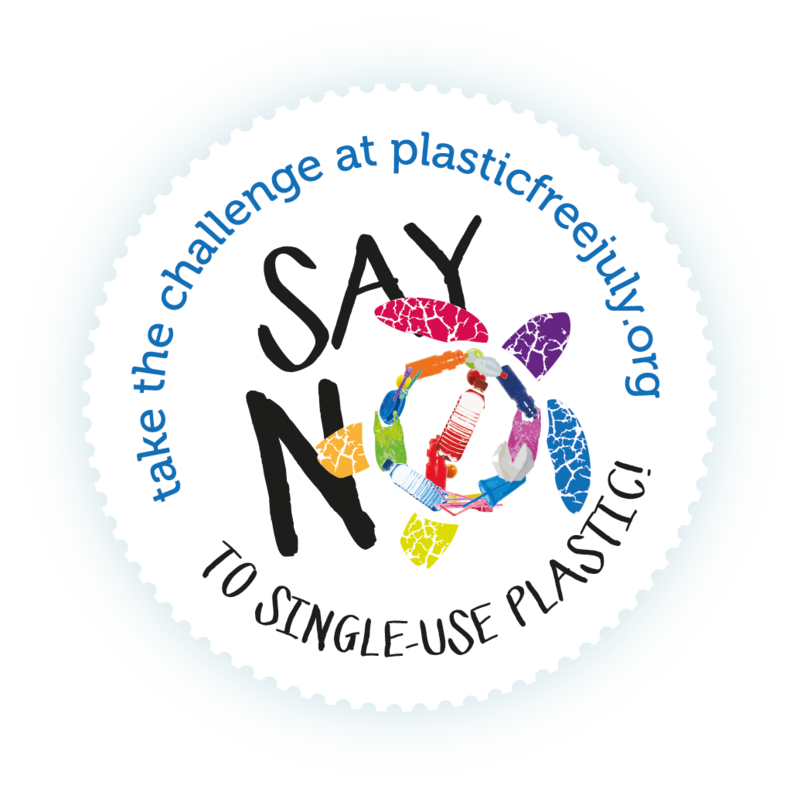 "Plastic Free July" Challenge is here! We are very excited to join this movement that counts millions of people around the world, sharing the same mission to get rid of single use plastics for good! This is our challenge: to reach 200 lbs of reduced plastic waste. If we make it by the end of July, we'll donate 10% of our profits. Below, learn more about our pledge and how you can take the challenge to help us. In need of inspiration? Check out our list of 7 simple changes and pick your favorite ones! If we reach 200 lbs of reduced plastic packaging by July 31st (as of June 30th our plastic meter indicated 132 lbs), we will donate 10% of our July profits to one organization dedicated to raising awareness about plastic pollution. 200 lbs of plastic = 7000 plastic water bottles, that's a lot of plastic!! You will be able to follow our progress on our 1st page every day. Choose 1 action every week and commit to it for the whole summer. Soon these changes will transform into habits and you will feel so good about yourself that you will want to do more! When your actions involve purchasing refills and zero waste essentials on our website, we calculate the equivalent of reduced plastic waste and proudly display it on our home page! Encourage your friends and family to follow your lead! Invite your friends and family to join this challenge by sharing this page. Brag about your victories on our Facebook page or tag us on Instagram with #plasticfreejuly. We are committed to support anyone who’s trying this challenge because every action counts and they all add up to make a big impact! Be kind to yourself: it’s a long process, you’ll only achieve your goal if you take it step by step. You’re reading this, it’s already a big step! In need of inspiration to make the switch? Here's a list of 7 easy changes to make to "de-plastify" your life. Feel free to PRINT THIS LIST AND PUT IT ON YOUR FRIDGE or anywhere else in your house where you can see it everyday and cross off each action when it's done. Thank you for taking action and feel free to comment below for any questions, we are here to help!